Couscous, a staple in Middle Eastern and North African cooking, is Tasting Jerusalem’s ingredient for April. 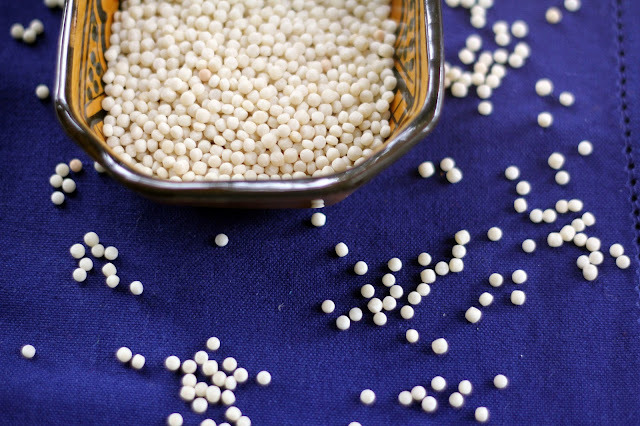 These cute little pearls of durum wheat semolina are commonly served with meat dishes, in soups, in salads or as a side dish. 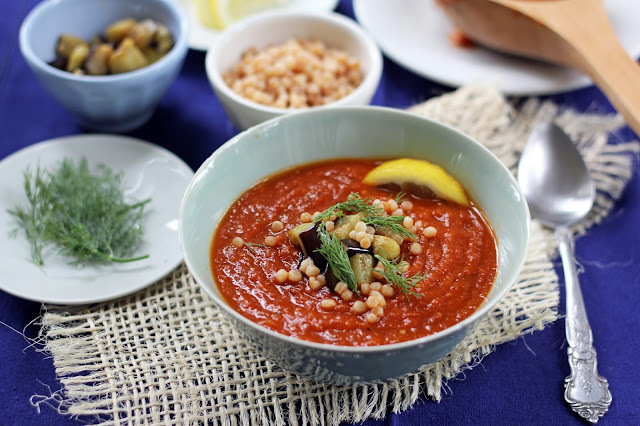 A recipe I’ve been eyeing in Jerusalem is the Burnt Eggplant and Mograbieh Soup. When this past weekend turned chilly and rainy, I decided it was an ideal time to make soup. 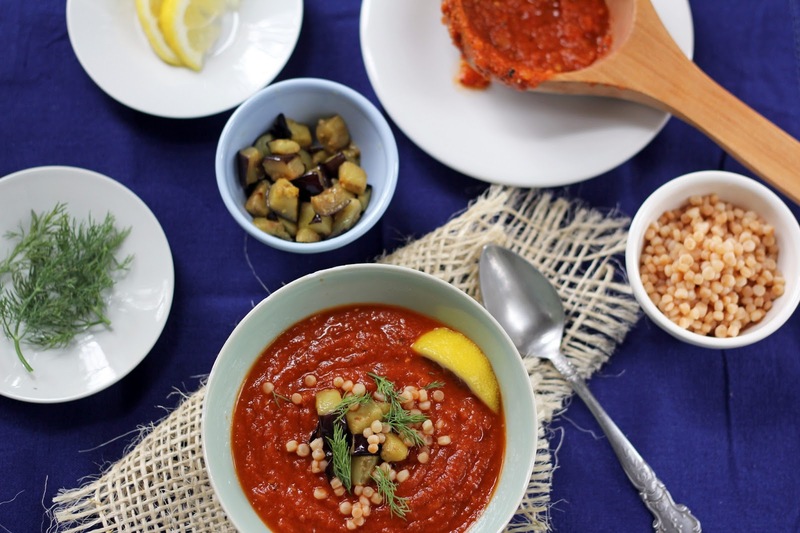 Charred eggplant is incredibly appealing to me and it’s amazing in this tomato-based soup. Mograbieh is Lebanese couscous, a larger-sized version than the tiny spheres typically seen. It’s similar to Israeli or giant couscous, which is readily available in Western markets. Since I just pulled our barbecue out for spring it seemed the perfect place to roast the eggplants. Sue, from Couscous & Conscientiousness, made the same soup and also used a barbecue. Less messy than the oven! Plus, you can’t beat the flavor that a barbecue imparts. I tweaked the recipe just a bit, using white wine in place of broth and increasing the tomatoes because we like things really tomato-ey around here. And before cooking the couscous, I toasted the pearls in melted butter until they turned golden and fragrant. When serving the soup, I kept the couscous on the side so everyone could scoop in the amount they desired. With its deeply satisfying, smoky flavor and bright pop of dill, this is a soup I’ll be happy to eat quite often! Beth and Sarene are also hosting a couscous recipe contest this month for Tasting Jerusalem. I decided to move in a sweeter direction with couscous and make a pudding for my boys. A lonely bottle of orange blossom water has been sitting in my cabinet for a while, and pairing this with honey and orange zest seemed a marvelous way to flavor the pudding. Orange blossom water has a truly lovely fragrance, and I’ve discovered it’s quite good in tea, too, so I think I’ll be keeping it within easier reach. I simmered Israeli couscous with cream and honey, whisked in egg yolks and coconut milk, then added a splash of orange blossom water and a bit of orange zest to finish the pudding. 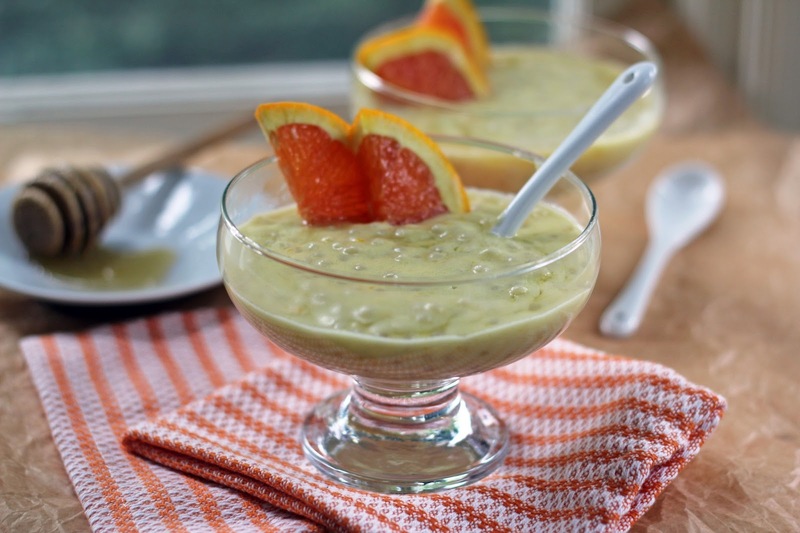 Warm, rich and creamy, with a hint of honey and the delicate scent of orange, this pudding is indulgent for breakfast or dessert. Needless to say, my sons devoured it quickly! In a medium sized sauce pan, bring the cream, couscous, honey and salt to almost a boil, lower the heat and let simmer for about 7-8 minutes, until couscous is al dente. In a bowl, whisk together the egg yolks and coconut milk until smooth. Slowly pour the coconut-egg mixture into the cream and couscous and stir. Continue cooking, stirring a few times, until the pudding thickens, about 6-7 minutes. 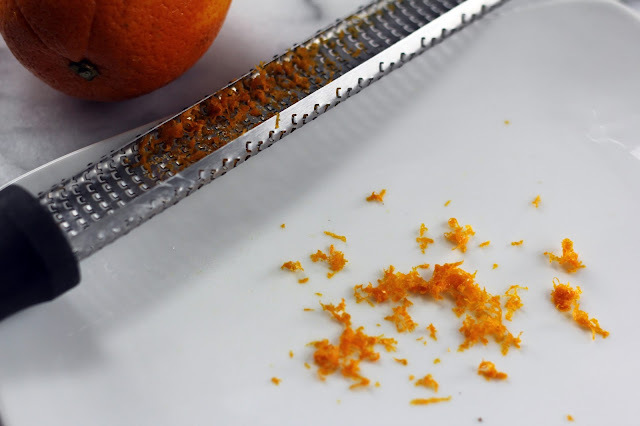 Remove from heat and stir in the orange blossom water and orange zest. Let the pudding cool slightly (it will thicken as it cools). 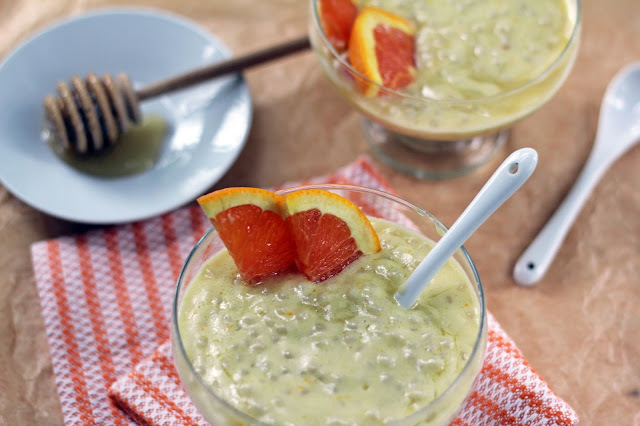 It’s best served warm or room temperature with orange slices a drizzle of honey. If you chill the pudding, it will thicken quite a bit so warm it and add a little cream or coconut milk to loosen it. Heat your barbecue on high, then lower to medium. Slice one of the eggplants in half lengthwise and set aside one of the halves. Pierce the whole and remaining half eggplant a few times and place on the barbecue. Close the cover and let cook for about 10 – 15 minutes. When blackened, turn them and cook for another 10 minutes. Remove from heat and let cool. Dice the raw half of eggplant into a small dice. In a large sauce pan or soup pot, drizzle a little olive oil and fry the eggplant over medium heat. Stir a couple of times, so most of the sides brown. Remove from heat and set aside. Add another drizzle of olive oil and the onions and cook over medium heat the onions are soft. Add the cumin, tomato paste, tomatoes and garlic and cook for about 5 minutes. Add the wine, water and lemon juice, bring to a simmer and then lower heat. Let cook for about 15 minutes. In a small sauce pan, melt the butter over medium heat and add the couscous. Stir and toast it until it browns. Watch closely, as it will turn dark and burn quickly. Add enough water to cover by 1 inch, a sprinkle of kosher salt and bring to a boil. Cook until just softened, about 8 minutes (depending upon your brand). Drain and set aside. 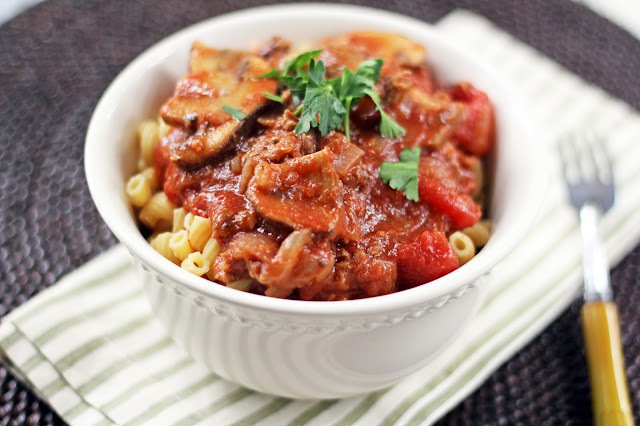 Remove the cook eggplant flesh and add to the tomato base. Using an immersion blender, blend the soup until mostly smooth. Reheat gently and add salt and pepper to taste. To serve, ladle into bowls and garnish with some fried eggplant, dill and a slice of lemon. Serve the couscous in a bowl alongside, allowing everyone to scoop out what they’d like. Yes, I have yet another fruit and cream dessert that I’m crazy for, and I’ve fallen rather hard. It’s one of those “please take it away so I don’t eat the entire thing myself” types of desserts. In reading British cookbooks over the years, I often came across a rustic sounding sweet called cranachan. Cranachan is a classic Scottish dessert and a quick look at the ingredients assured me I would love it. In the spirit of Eton Mess, Pavlova and strawberry shortcake, this is a cream-and-fruit inspired treat. Rather than including meringue or biscuits, though, this one features toasted oats. And whisky. A traditional cranachan is made with raspberries, but as we won’t have fresh raspberries for a while I decided to break with tradition and use rhubarb. 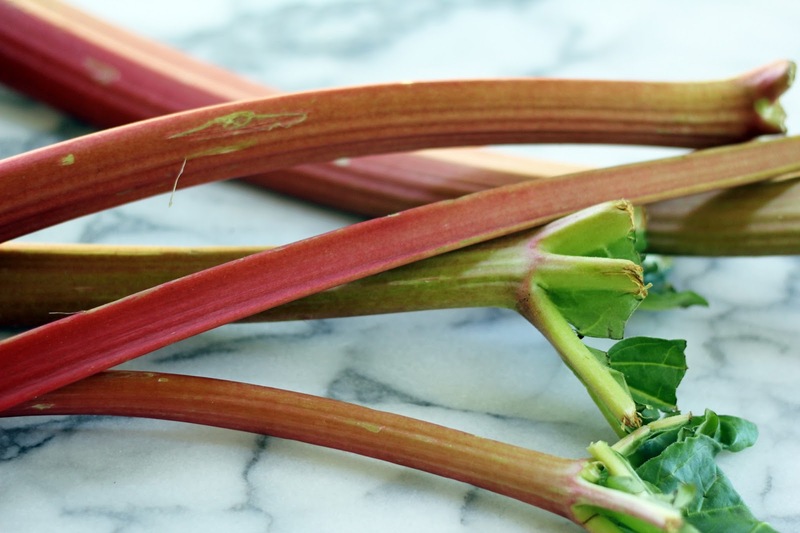 I’m itching to cook with rhubarb since the slender crimson stalks are appearing everywhere now. Growing up, we had a small patch and I remember my mom heading out many mornings with a kitchen knife to cut some for her pies. I’ve always had a fondness for rhubarb with its tart, bright flavor, and I thought it would make a lovely understudy for raspberries in my cranachan. I simmered some diced rhubarb with honey, until it softened and turned into a rosy hued sauce. The oats were scattered on a griddle and heated until they browned a bit and smelled warm and fragrant. I whipped the cream and added a splash of Scotch whisky (I can’t mess with tradition here – it must be Scotch!) and the preparation was done. This is a homey dessert, so I put the bowls of the ingredients out on the table and let everyone make their own. A layer of rhubarb, a scoop of oats, a dollop of cream and we could each stir up our cranachans. 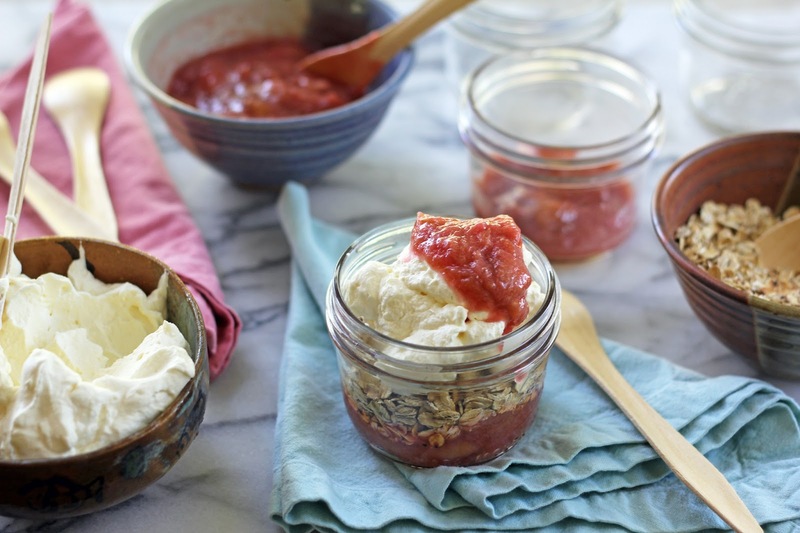 The cream balances out the tart rhubarb beautifully, with just a whiff of whisky, and the oats add toasty crunch and flavor. Simple comfort. Place the rhubarb and honey in a medium sized sauce pan over medium-high heat. Bring it to a simmer and mix. The rhubarb will start to soften and break down, releasing juices. Lower the heat and let cook for about 15 minutes, until the rhubarb is soft and rather like a sauce. Set aside to cool. Spread the oats out on a griddle or large fry pan. Over medium heat, stir and gently toast them until they begin to turn a bit brown and are fragrant. Watch closely as they can burn easily. Set aside to cool. Using an electric mixer, beat the cream until soft peaks form. Add the Scotch whisky and gently stir. You can make it ahead and keep in the fridge. 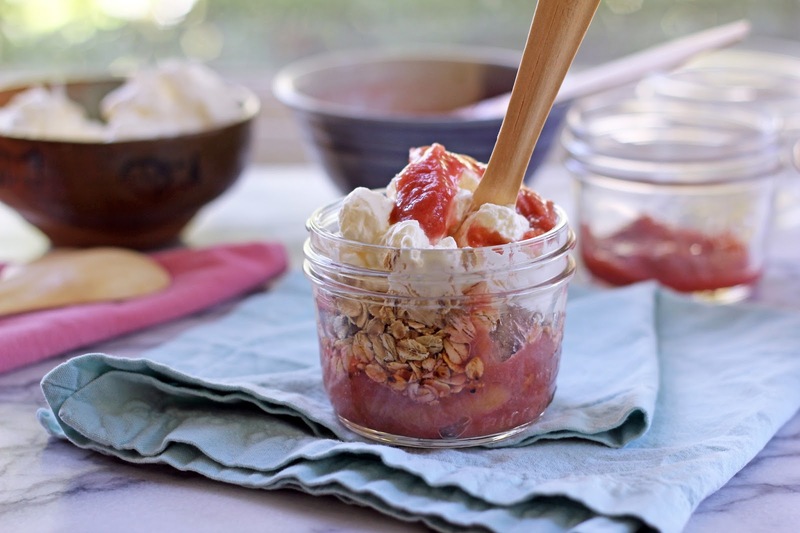 When ready to serve, place the rhubarb, oats and cream in individual serving bowls with spoons and bring them to the table, along with small dessert dishes and spoons. Scoop from each bowl, mix and enjoy! Back when I first moved from Boston to Los Angeles for college, I confess I mostly had the beach and sun on my mind. Little did I know, new love would be found next door, both with the boy living there (now my husband) and for the fresh artichokes to which he introduced me. Eating an entire artichoke just seemed so California....I loved it! Prior to this, my artichoke eating experience had been limited to marinated hearts from a jar (quite good, I must say). Eating this thorny thistle leaf by leaf, though, scraping a delicate bite off each one and then digging through the choke to the tender, hidden heart was just downright fun and delicious. Artichokes are beckoning in the market now, another welcome sign of spring. 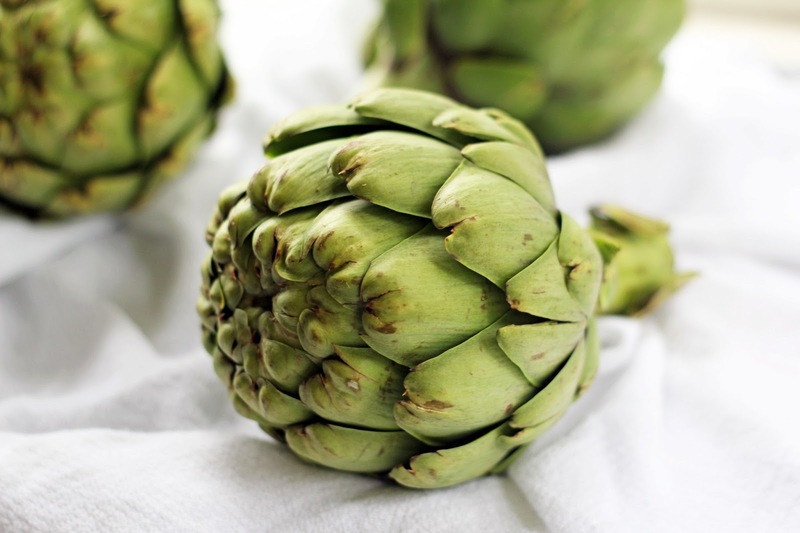 Our favorite way to enjoy artichokes is to steam them and then start dipping in little bowls of melted butter and lemon juice - simple and classic. This last time, though, I decided to make an umami-rich dip using two ingredients that I could happily eat everyday – avocadoes and anchovies. I blended these with green onions, lemon, garlic and parsley. Bold, creamy and assertive, this is one tasty green dip! It is also quite good dolloped on scrambled eggs or mixed with some baby greens. Toss a couple of those lovely green globe artichokes in your basket, blend up a batch of dip and soon you’ll be savoring a taste of spring. 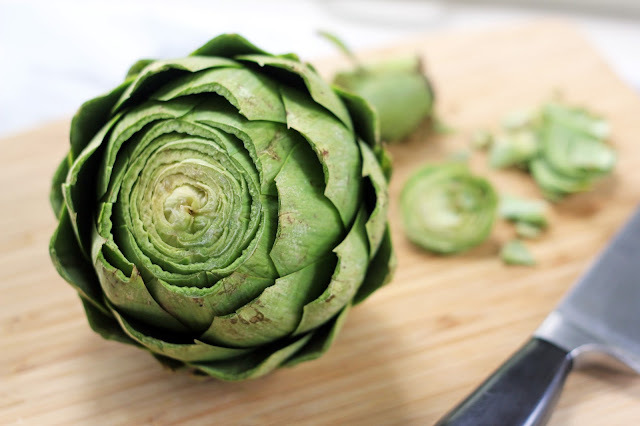 To prepare the artichokes, first cut the stem off to create a stable base. Using scissors, clip the thorny tip off of each leaf. Lay the artichoke on its side and using a knife cut the very top off the artichoke. 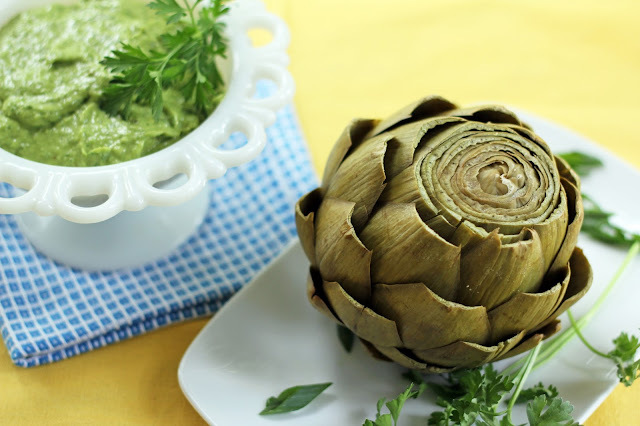 If preparing ahead, rub with the cut lemon to prevent browning, otherwise you can place the artichoke in a large pan and prepare the remaining ones, adding them to the pan. Food52 has a tutorial on preparing artichokes that is helpful to read, as well. Fill the pan with about 2 inches of water and bring to a boil. Cover and reduce the heat to a simmer. After about 25 minutes of steaming (or sooner if you have smaller artichokes) start testing by pulling on a leaf. If it tugs out easily, the artichokes are done. If not, steam for another 5 minutes and test again. 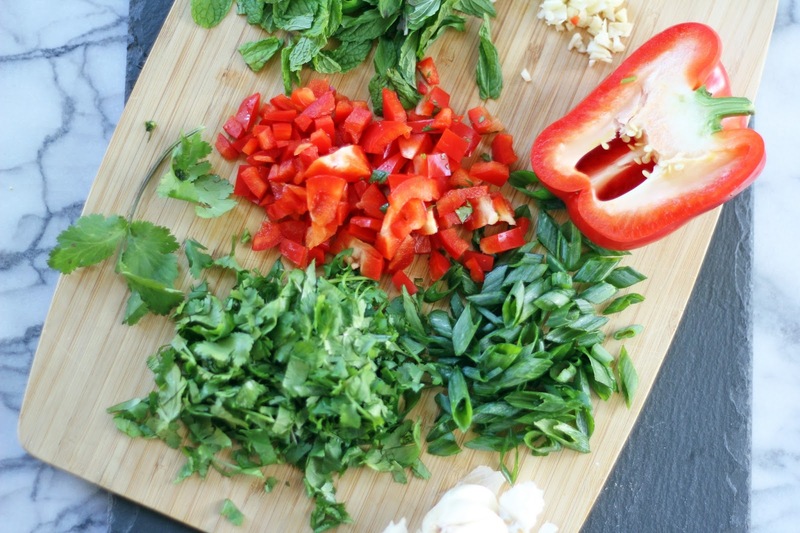 Remove from the heat, drain and set aside at room temperature. 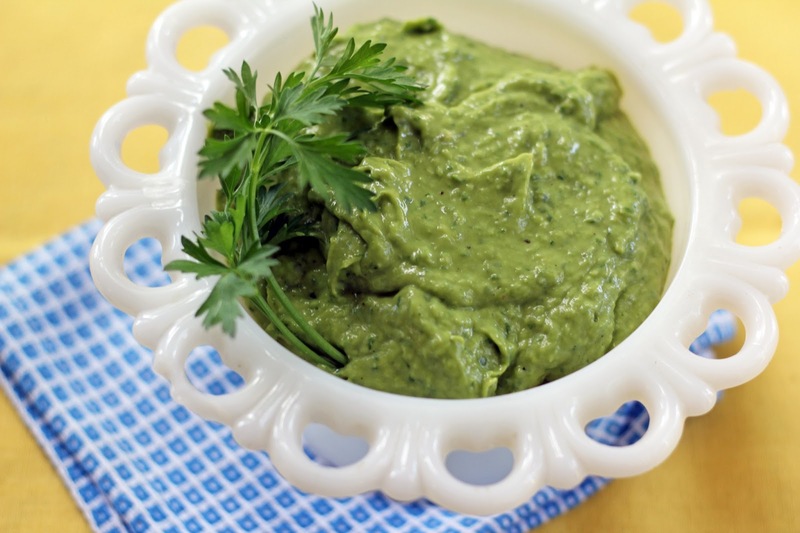 In the bowl of a food processor, add the anchovies and their oil, green onions, avocado, lemon juice, garlic and parsley. Process until smooth, pausing to scrape down the sides a couple of times. Scoop into a serving bowl, place the artichokes on a platter and start dipping. 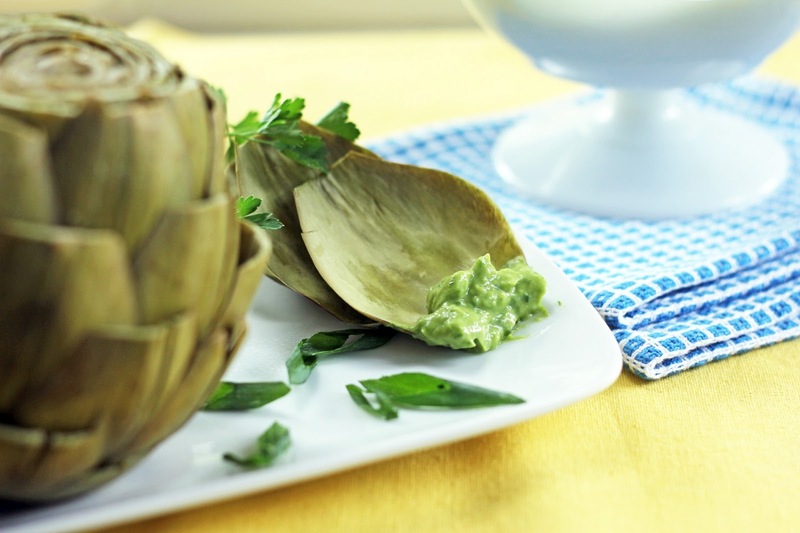 You can make both the artichokes and dip ahead. Let the artichokes sit at room temperature and keep the dip covered in the fridge. Earlier this month, we had the pleasure of celebrating the Bar Mitzvah of our family friend, Jake, as he turned 13 and became a Jewish adult. Following the service in the synagogue, a festive lunch is served for everyone attending. Usually this is a catered event, but more often now families are choosing to prepare the lunch themselves with the help of friends. I love it! What a happy way to gather together. It makes me think of communities long ago, when women shared in the cooking for their families and baked bread in the town ovens. For Jake’s event, friends met in our synagogue kitchen and cooked away for 275 guests. Over a few days, we chopped, we laughed, we baked, we chatted and we stirred. We enjoyed creating this celebratory meal together. There are quite a few talented cooks and bakers in our community, whose specialties are well loved. 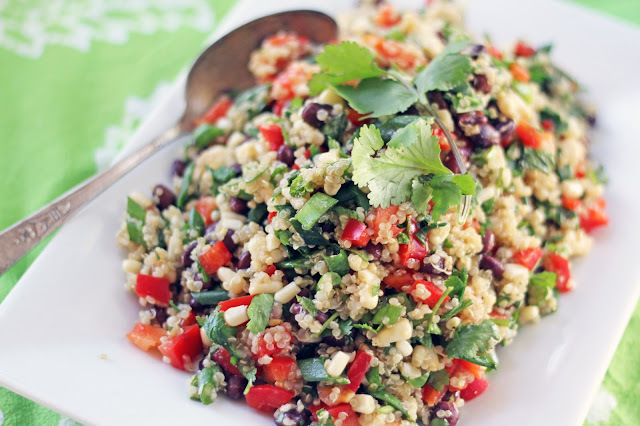 One such friend, Iris, makes the perfect quinoa – fluffy and flavorful – for her signature salad with a Southwest flair. She first cooks the quinoa with cumin, salt and pepper. I could happily eat it just like this, but Iris creates a salad bursting with so much taste that I always find myself eating many bowls of it ... and this time asking to share the recipe. 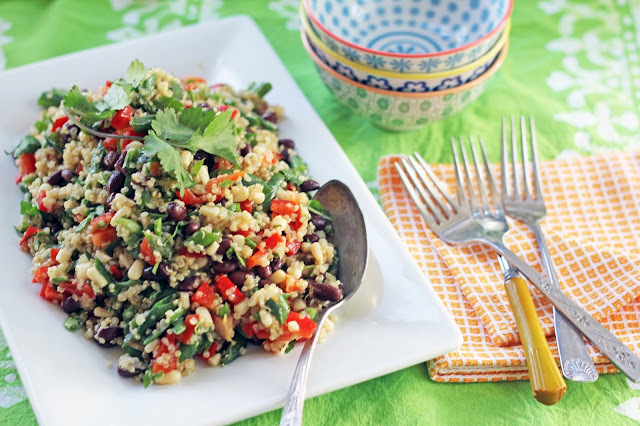 Black beans, corn, red pepper and an abundance of chopped herbs are mixed with the quinoa and simply dressed with lime juice and olive oil. Bliss. Each colorful bite bursts with the freshness of cilantro, mint and green onions. Crunchy and soft, zesty and satisfying, this salad makes a marvelous light lunch or an ideal side dish for grilled fish or chicken. With special times such as this, I’m reminded again of what a gift it is to be part of such a vibrant, caring community. Mazel tov to Jake! This week, with the horrific events at the Boston Marathon, I feel even more grateful for community. Boston is my hometown and I cheered along the Marathon route many times. I am heartbroken by this devastating tragedy and my thoughts and prayers are with the victims, their families and the city. Combine the quinoa, water, cumin, salt and pepper in a medium sized sauce pan and bring to a boil. Cover the pan and lower the heat to a simmer. Let cook until the quinoa is soft and water is absorbed, about 13-15 minutes. Remove from the heat and keep covered for 5 minutes. Uncover and let cool. 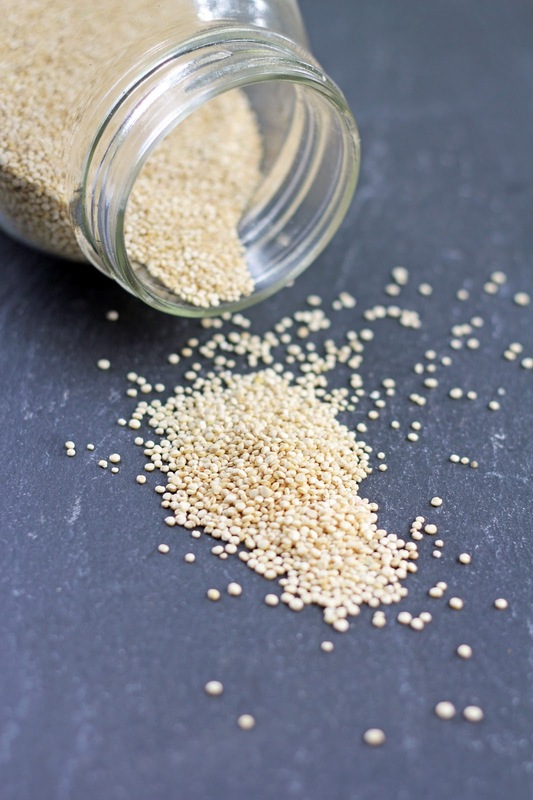 The quinoa can be made a day ahead and kept in the fridge. Bring to room temperature before proceeding. Place the quinoa in a large serving bowl. Add the mint, cilantro, onions, red pepper, beans, corn and garlic. Squeeze the juice of one lime in and drizzle in the olive oil. Stir gently, taste for additional lime juice, salt and pepper and add more if needed. Serve at room temperature. Date shakes are good. I mean, seriously good. A week ago, Bob and I slipped out of town to Palm Springs to meet some friends. It had been more than 20 years since I was last there. Memories of road trips to Palm Springs were on my mind, taken with my friend Rebecca during our years of living together in Los Angeles. The two of us would bop into town, shop for howling coyote- and cactus-themed tchotchkes for our apartment, spend the afternoons by the pool with frosty cocktails, and then gobble Mexican food at our favorite little hole-in-the-wall spot. A trip to Palm Springs was never complete, though, without a stop along the way for date shakes at Hadley Fruit Orchards. 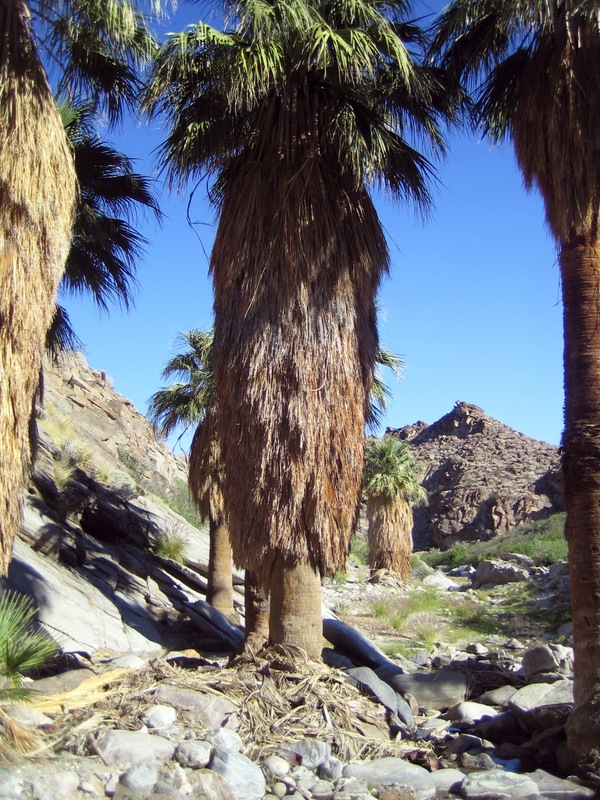 Date shakes are synonymous with Palm Springs, given all the date palms that grow in the surrounding Coachella Valley. 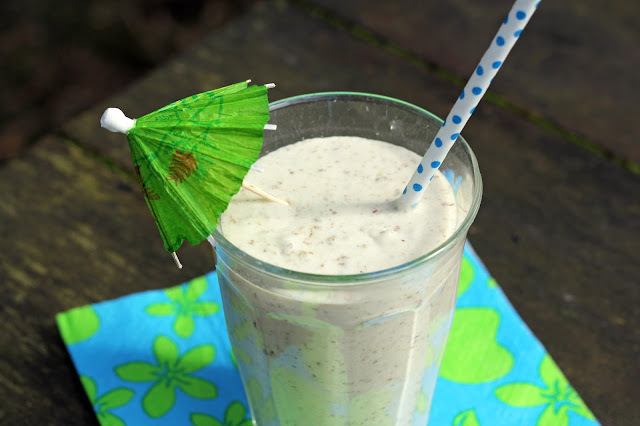 According to California legend, the date shake was invented in the 1930s by a local date farmer. I hadn’t thought of date shakes in many years, and during our whirlwind visit I developed an intense craving. There are many varieties of dates and Hadley’s uses deglet noor. 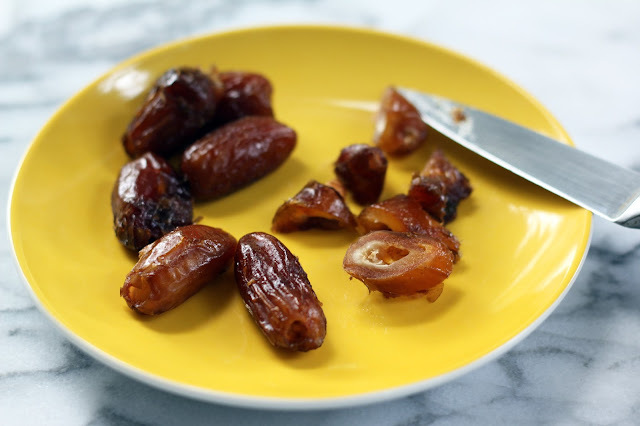 These also happen to be my favorite dates, with their irresistible soft, sticky, caramel sweetness. 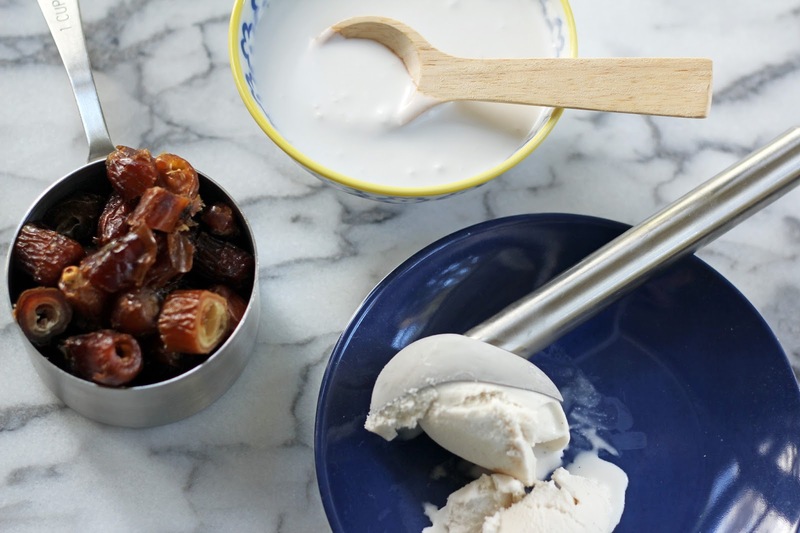 Vanilla ice cream, milk and dates are the classic date shake ingredients. Lately, though, we’ve been devouring pints of coconut milk ice cream, so I decided to use a vanilla flavored one along with coconut milk for my date shake. After chopping the dates, I blended them with coconut milk until they were almost smooth and then added the coconut ice cream. Oh my. 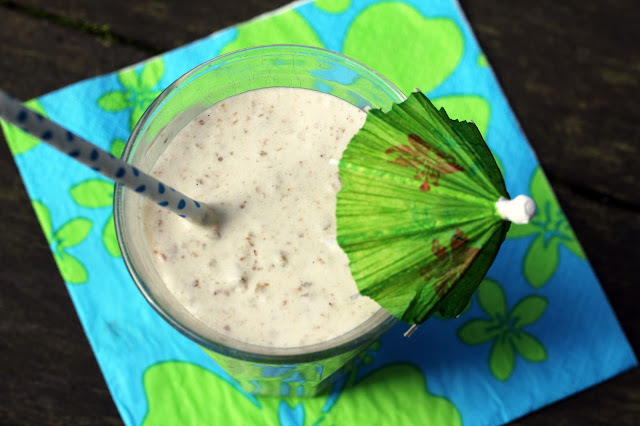 Luscious, rich, creamy and filled with sweet dates, this shake is heavenly and truly a blast of nostalgic taste for me. Today, there was an afternoon break in our April showers, so after whirling one up I was able to steal outside and sip my shake in the sun. Granted, this wasn’t the hot sunshine of Palm Springs (last week was 90 degrees! ), but I popped in a festive little umbrella and pretended I was sitting under a palm tree in the desert. Life is good. In a blender, whirl the dates and coconut milk together until fairly smooth. Add the ice cream and blend until creamy. Pour into glasses and serve. The shake is thick, so a spoon may be needed, as well. Last week, after Passover ended, our kitchen shelves filled once again with bread, cereal, grains and pasta. This time of year always calls for a hametz-filled dinner with pizza or spaghetti and usually a beer or two (no beer during Passover either). And when you say spaghetti in our house, it always means my mother-in-law’s spaghetti! We used to call this spaghetti Mom’s Spaghetti, but over the years it has been lovingly renamed Grandma’s Spaghetti by my sons. Bob’s mom, Ann, did not have a large cooking repertoire, but what she did have was marvelous, with some delicious gems like peach dumplings and homemade fried corn tortillas for taco night. When Bob and I were engaged, Ann shared her spaghetti sauce recipe in a Cordes family cookbook that was given to me at my wedding shower. This hearty, homey spaghetti has been warming our bellies ever since. This is total comfort food. 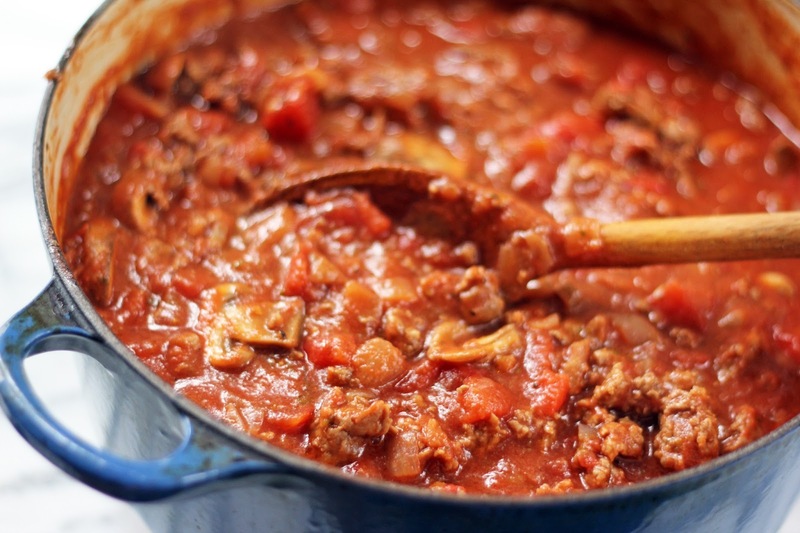 A simple sauce is made with ground beef, mushrooms, onions, garlic, oregano and tomatoes. 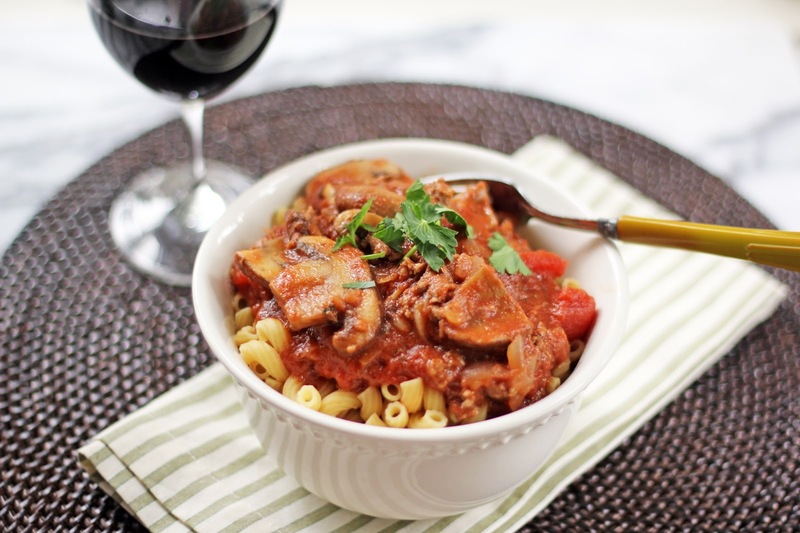 It is incredibly satisfying and easy to make for a weeknight dinner. In fact, I usually double the sauce to have leftovers for lunches. And we always serve it with elbow macaroni, just as Ann did when Bob was growing up (she said feeding three kids long spaghetti noodles was just a mess). When the answer to, “What’s for dinner?” is answered with “Grandma’s Spaghetti!” then all of my boys are happy. I miss my mother-in-law. Ann was a character, had a lively personality and loved a good story. I have many memories of her heartwarming laugh. She is dearly missed and was a Mom to many of us during her short but colorful life. This Mother’s Day, it will be 15 years since she passed away. Eating her spaghetti and telling stories of her antics evokes warm memories for Bob and me and helps our boys recall their pistol of a Grandma. In a large Dutch oven or fry pan, warm the olive oil over medium heat. Add the diced onion and cook for a few minutes, until it begins to soften. Add the garlic and oregano and stir. 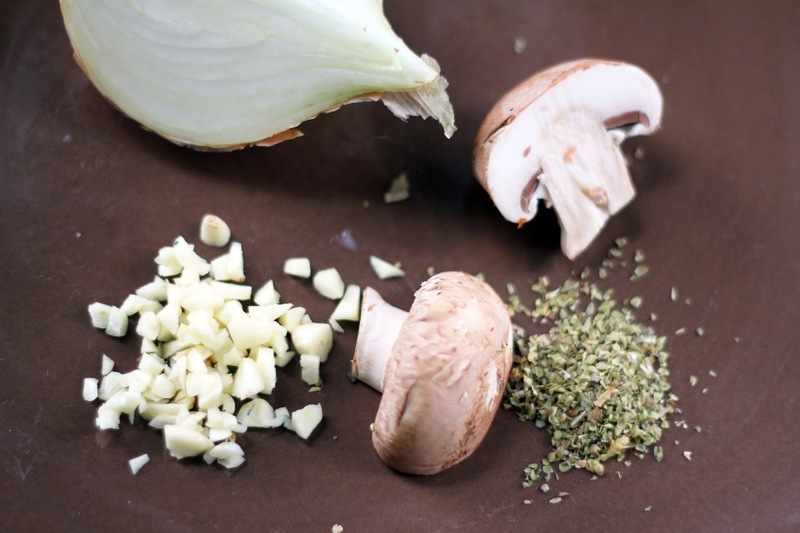 Add the mushrooms, stir and cook for a few minutes. Add the ground beef and break it up with a spoon. Stir and cook until the beef is mostly browned with just a little pink left. Add the chopped tomatoes with their juices, tomato paste and a teaspoon of kosher salt and freshly ground pepper to start. Stir and bring the sauce to a boil, then lower the heat and simmer until the sauce thickens, about 30 minutes. Give the sauce a stir and taste for salt and pepper. 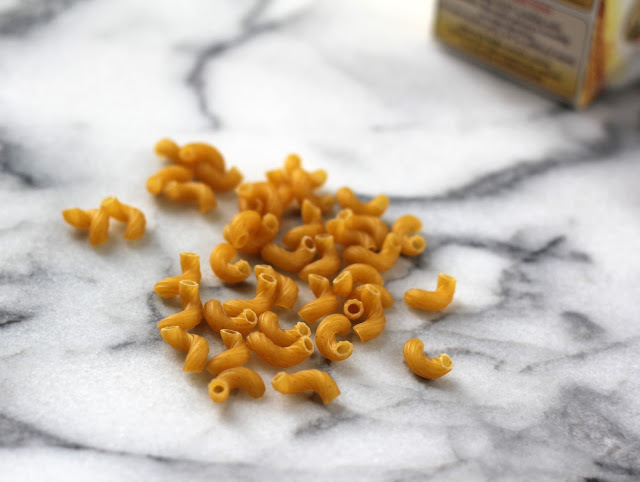 Ladle over macaroni and enjoy. As I write, I am humming the Chia Pet jingle. I grew up watching this commercial on TV and was the proud caretaker of a few of my own Chia Pets. At the time, I would not have considered eating the seeds I was mixing to make my pet magically grow its green body, but now they’ve become a staple in my kitchen. The health benefits of these ancient seeds are remarkable. A member of the mint family, chia is the richest plant source of Omega-3, stabilizes blood sugar levels, contains anti-inflammatory properties and is a great source of protein. Wow! Aside from its nutritional punch, chia seeds also taste good. 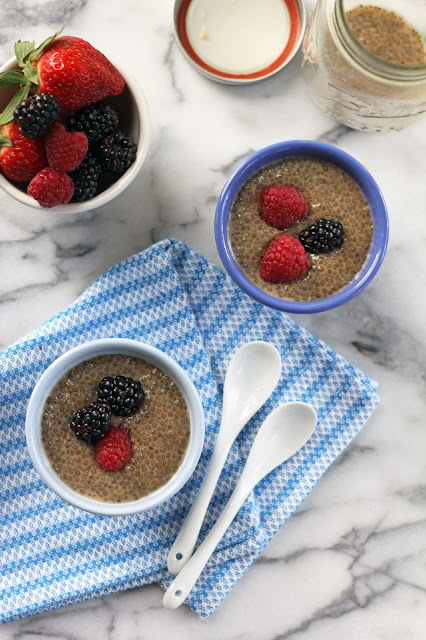 Chia seeds have a mild, nutty flavor and can be sprinkled on salads and yogurt, stirred into oatmeal or tossed into muffin batter. My favorite way to enjoy these little brown seeds, though, is in pudding. 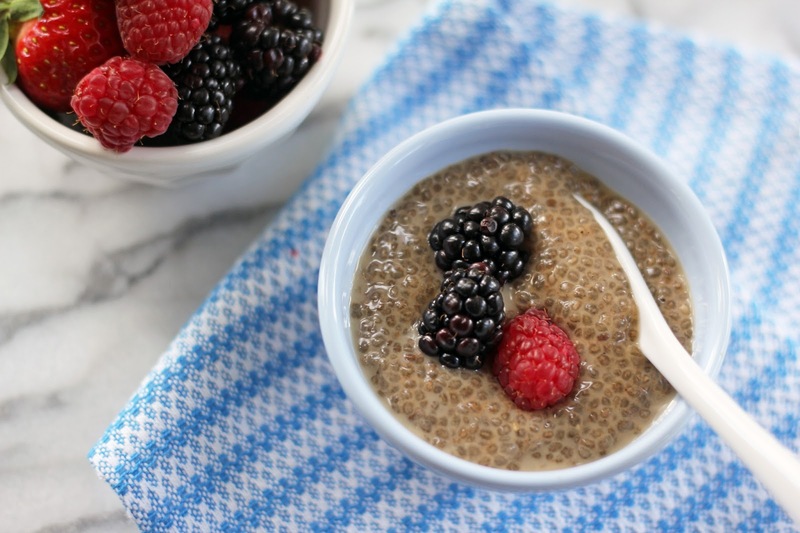 When chia seeds are soaked, they absorb a large amount of liquid and transform into a texture rather like tapioca pudding. This simple little pudding is a snap to create. You can make it with the liquid of your choice – milk, juice, coconut milk or almond milk all work well. 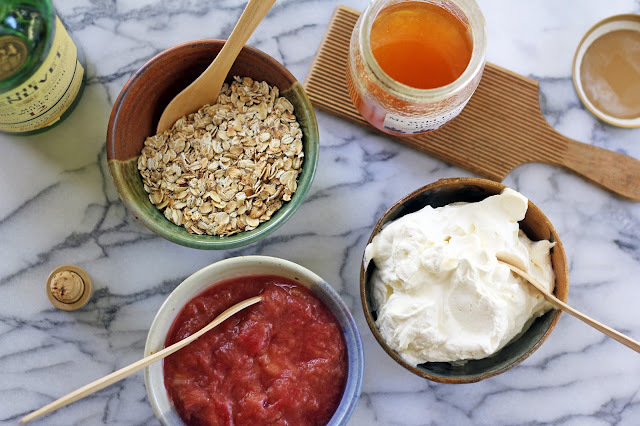 Dried fruit, toasted coconut, maple syrup, cacao nibs or nuts are all tasty suggestions to add. 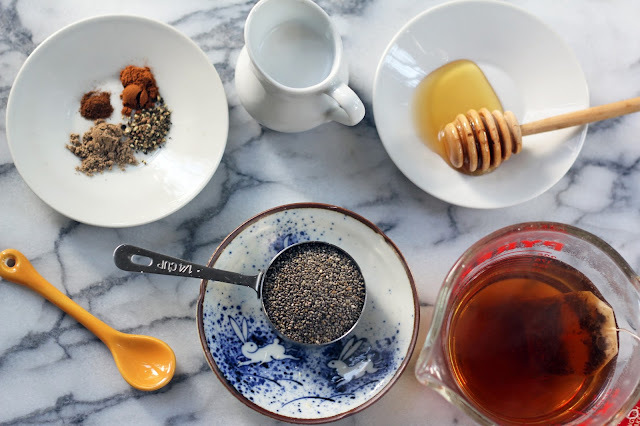 Just mix your ingredients together and let the chia seeds work their magic. This is a marvelous breakfast to prep the night before. In the morning, grab your jar from the fridge and you’ve got a delicious start to your day. If you’re feeling fancy, you can even layer the pudding with fresh berries and yogurt for a pretty parfait. 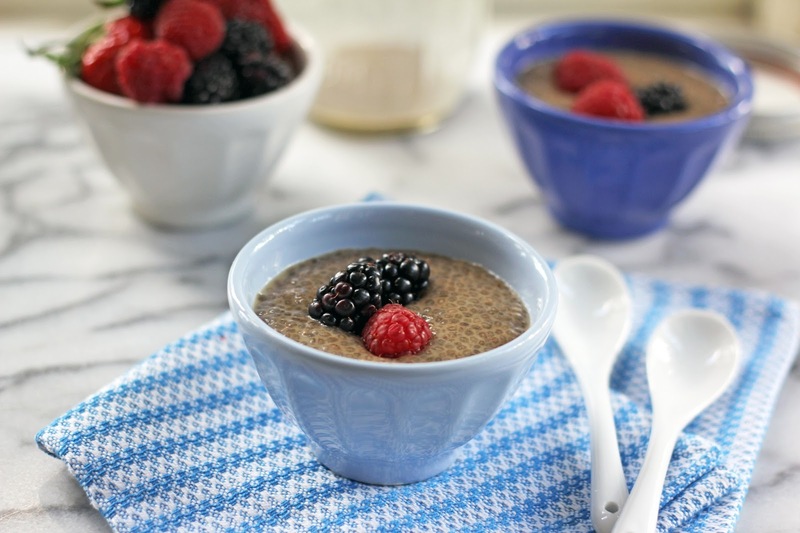 Since I drink tea most mornings, I decided to try using it for chia pudding. I love the sweet, spicy taste of chai spices, so I stirred in some cinnamon, cloves, cardamom, black pepper and a drizzle of honey. For a bit of creaminess, I added coconut milk (whole milk also tastes good). When the pudding had thickened, I topped it with fresh berries and enjoyed a terrific breakfast. Singing ch-ch-ch-chia has taken on new meaning! After steeping your tea, pour it into a jar or other container with a lid. Add the cinnamon, pepper, cloves, cardamom and honey and stir. Set aside to cool until room temperature. Add the milk and chia seeds and stir well. Cover and pop it into the fridge. 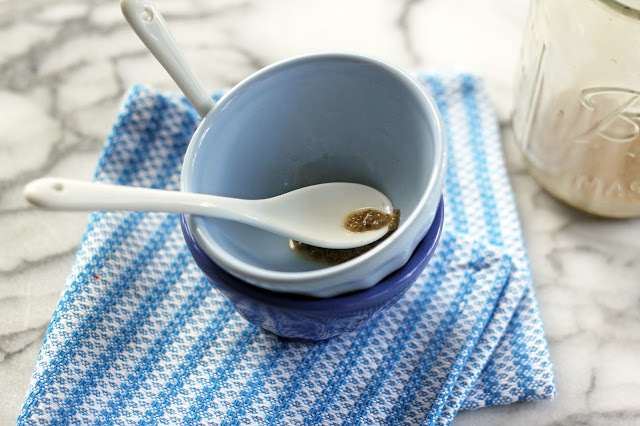 After about half an hour, give it another good stir to prevent the chia seeds from clumping. Chill for a couple of hours or overnight. When ready to serve, give the pudding a stir and spoon the pudding into two bowls and top with berries.